Before the invention of the modern combi condensing boiler, most people had a hot water cylinder (tank) upstairs fitted in an airing cupboard. A single coil of copper pipe is fitted into such a cylinder through which water is pumped after it has been heated externally – e.g. by a gas boiler, or stove back boiler etc. 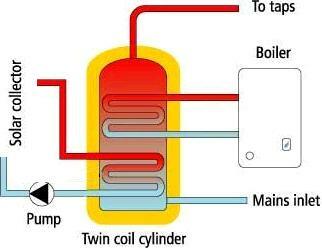 This is called indirect heating since the hot water which comes out of the cylinder does not itself pass through the boiler, but is instead heated up by externally heated water passing through the coil. (The alternative is a direct heating system explained here.) An electric immersion element is also typically fitted in the top of such a cylinder to give an alternative (and faster) method of (directly) heating water in the cylinder. When a solar water heating panel is installed, often the (single coil) hot water cylinder has to be replaced with a twin coil cylinder. This cylinder is identical in all ways to a standard hot water cylinder except for the addition of a second coil through which the fluid heated by the solar panel is pumped transferring its heat to the water in the tank. Since twin coil hot water cylinders are typically used with solar heating applications, they are usually better insulated than standard cylinders – look for at least 50mm of fitted insulation, and add an insulated cylinder jacket as well to ensure that as much heat as possible is retained in the hot water tank overnight. It used to be quite difficult to obtain a twin coil cylinder, but now as solar water heating has become more common here in the UK, it has become much easier. Screwfix have a couple of excellent options pictured above: RM 210 ltr Twin Coil Copper Solar Cylinder and RM 180 ltr Twin Coil Copper Solar Cylinder. 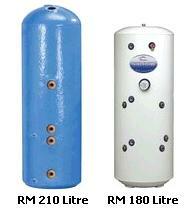 Both tanks are vented grade 3 cylinders with 50mm of insulation, and are designed for a maximum working head of 10 metres.